Online voting for the Woman Bowler of the Year and Young Woman Bowler of the Year Awards runs until midnight on Sunday 11th November, with the winners announced at the Bowls England Women’s Annual Dinner and Presentation of Prizes at St Johns Hotel, Solihull on Saturday 24th November. The sad news has reached us today that Jim Warland, for many years a stalwart of Pressed Steel, Rover and The Oxford Bowls Club and for the last two years a member of Watlington Bowls Club, passed away peacefully on Tuesday morning in hospital. In addition to all the work he did at club level, he was also a long time Executive member of the English Indoor Bowling Association. News has come through of the passing of Herbie Payne on Sunday. He will be remembered by many bowlers in Oxfordshire and neighbouring counties due to his involvement in the game both outdoors and indoors. He had suffered with health problems for some time and had decided that he was retiring as Section Secretary of the Pairs at the end of the season. His support to the county was much appreciated, as was we are sure, his involvement with the Indoor County Association. Our thoughts and sincere condolences go to Jayne and his family. His funeral will take place at Oxford Crematorium, 2.00p.m. On Thursday 25th October and afterwards at South Oxford Bowls Club. Oxfordshire played their final friendly of the 2018 season against Essex at Wanstead Cemtral BC on Tuesday 18th September. Wins on 2 rinks and a loss by 1 shot on a third were not enough for Oxfordshire to finish the season on a winning note. Mike Jones John Stephens Alex Fleming Ian Whelpton lost 13-24. Ron Slater Bill Jarvie Martin Oliver Chris Lewis won 19-18. Barry Willoughby Colin Haley Mick Morris Alan Ley won 16-15. Paul Demczak Henry Franklin Ken Williams Mike Andrew lost 18-19. Steve Tolhurst John Timms Jim Lucas Brian Bloomfield lost 15-31. Roy Radband Douglas Wright John Hurren Brian Clarke lost 15-22. Carol Gaskins (Oxford City & County) has won the 2018 ladies county champion of champions. There were 14 entrants for the competition which was held at Chipping Norton BC on Saturday 22nd September. The good weather finally deserted us and the matches were played on a grey, drizzly day. But what a Final. 28 ends lasting three hours, amazing bowling in miserable conditions after a long day, finishing almost in the dark. Both players produced excellent bowling and both deserved to win. Many thanks to all the bowlers who played and to Chipping Norton BC for hosting the event. The hot soup was most welcome and BOL are very grateful for their hospitality. Posted in: Competitions, County, Women. On Saturday, 10 teams from across Oxfordshire met at Banbury Chestnuts for the Summertown Trophy finals day sponsored by Oxford Auto Dents. All teams played each other over 7 ends in a round-robin format, to compete for over £1,000 in prize money. 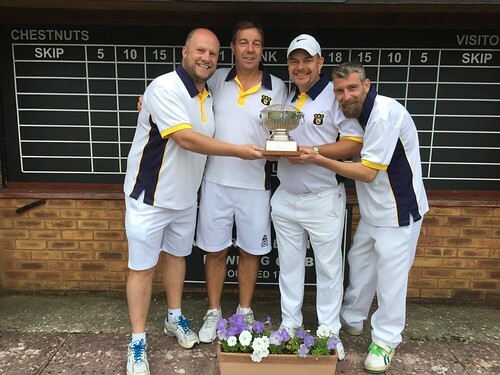 Amongst some of the regular qualifiers, there were 3 new clubs qualifying for the first time – Charlbury, Burford, and Summertown. comfortably ahead on +20 shots at lunch, with Headington A trailing in second. Last year’s runners-up Watlington A didn’t get the start they were hoping for, losing heavily to first timers Charlbury in their opening game, but then remained unbeaten for the rest of the day. second; and West Witney had an outside chance still in third. With just 1 end to go all 3 teams were still in contention, as Headington A trailed West Witney and Watlington led Headington B. However, Nick Rae-Welsh’s four of Ian Snowdon, Simon Hastings and Ray Gaskins managed to win a crucial last end, and Headington A held on to claim first prize. Shane Cooper, in his last game for Watlington, picked up the Astall Ley trophy in second place, and West Witney finished the day in third. The Blay Benevolent Cup, played on Sunday 16th September at Kidlington Bowls Club, was won by Wendy Sandy (Carterton) and Josie Gilbert (Oxford City and County). The plate eas won by Carol Penson (Oxford City and County) and Angela Ives (Banbury Borough) were played on Sunday 16th September at Kidlington Bowls Club. 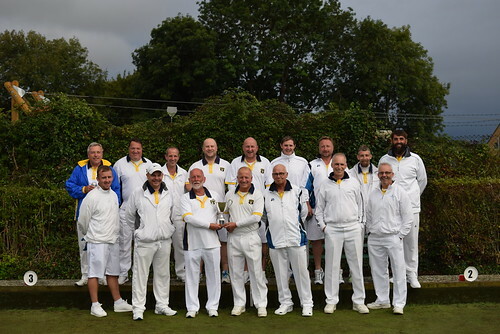 It was an open pairs draw from 20 entries this year with first round winners going on to play for the Cup with first round losers playing for the Plate. And there were some very close games with extra ends being played. A very enjoyable day with many thanks to Kidlington for hosting this event and for providing excellent food. Also thanks to everyone who provided raffle prizes enabling us to raise funds for the Blay Benevolent Fund. The men’s County side had a convincing 34 shot win against Worcestershire in Tuesday’s game played at Kidlington. Having driven through downpours of rain, the Worcestershire team arrived to find dry blustery conditions and a green which varied from very green on rink 1 to very brown on rink 6. Once one the green, bowlers were greeted with a fast and even surface, which was very different to what was expected on it’s appearance. After the game bowlers and their guests were treated to a Roast pork dinner and trifle and Kidlington’s usual hospitality. Alan Ley’s four took the highest winning rink prize and after being behind for virtually all of the game, a notable six on the nineteenth end set up a win for Mike Andrew’s quartet.